wrong with this promo image? recently, i found this in my inbox. it is a typical piece of mail and from the quick once over, a typical piece about underwear (sadly yes i can say promotional emails about underwear are normal for me - don't judge). then i looked closer at it. 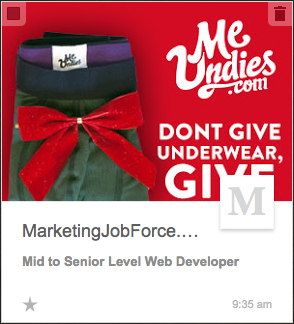 this is actually from marketingjobforce.com, and the subject line isn't about underwear, it's "mid to senior level web developer". 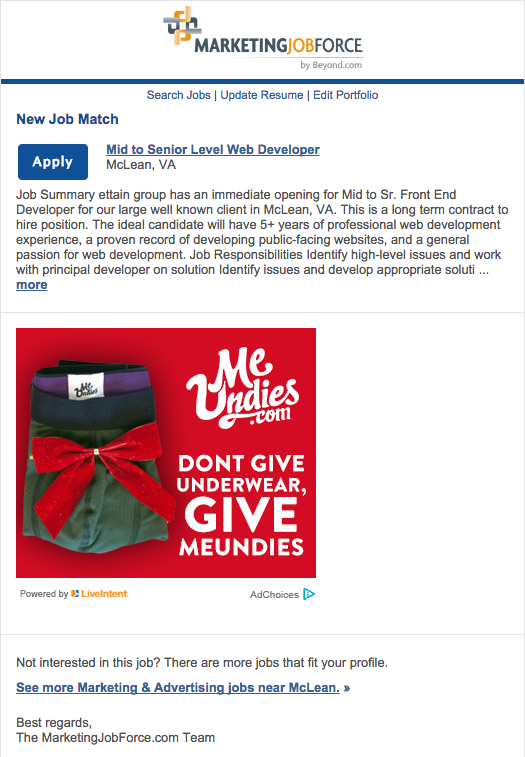 looking closer, i really asked myself, " how are these two things connected, and is meundies.com the one that is looking for a mid to senior level web developer?" i had to open this email. as you can see in the image below, the email is really about a mid to senior level web developer position opening that marketingjobforce.com is promoting. marketingjobforce.com sells ad space in their newsletter and since that ad is the biggest image in the email google used that image as the promotions tab image. this is a common practice with a lot of emailers doing it. but doing this and not thinking about all of last year's email provider changes could impact your communication's effectiveness and to some degree brand-quality/reputation. you have to be aware of all things gmail these days. how do you avoid situations like this? the most efficient way of limiting this type of "oh...that's interesting moment" is to design a single image that gets used as the promotions tab image and place the code for it in the header of your messages. i actually prefer this method, but i dynamically insert it in communications only for those addresses that contain gmail in them. doing it this way, i limit any deliverability risk with the other isp's that make up my database since they might see that snippet of json as an odd piece of code worthy of the spam folder. what else can you do to limit this? ask your gmail subscribers to drag your emails the primary tab. they signed up with you because they wanted your content, there is nothing wrong with you asking them to move you into the primary tab. in fact it may actually help you with gmail deliverability because it demonstrates to gmail that your readers are (1) opening your email and (2) engaging with your email and (3) that they really want to read it. is this a tactic to increase open rates? you may be thinking that this was done on purpose as a tactic to drive open rates, and honestly, if i didn't work for such conservative organizations i would try something like this in a heartbeat. but there are two reasons why i don't think that is the case. if you look at the first image above, you'll see that the logo for marketingjobforce.com is just a grey "m". this is gmail's standard place holder treatment when a sender hasn't configured a google+ page or set up their email templates with the link/json to that verified google+ account. gmail uses that page as the source of your logo. secondly, think back to can-spam, isn't email supposed to be clear and honest? purposely using an advertisement for underwear when you're trying to fill an open position is misleading, which for the right person, could result in a formal can-spam complaint. the take-a-way from this is that gmail has given us a great way to attract the attention of our readers in a densely populated inbox by making email more visual. it's up to us how we use those images to enhance (or detract from) the core message we send out to our users. the question you should ask is "do i trust gmail enough to use the first image it sees that fits (size) the promotions tab image box, which could potentially change the meaning of my message or damage the brand, or do you take the time to tell gmail which image i want to use and develop a visually cohesive and brand-compliant message experience?"